Help your students develop the blended competencies (cognitive, technical, interpersonal, and ethical/legal) they will need to effectively care for patients in both institutional and community-based practice settings with this updated Eighth Edition of the best-selling Fundamentals of Nursing. Packed with clinical examples, proven pedagogy, striking illustrations, and online learning tools (including video clips, animations, and interactive learning activities), this best-selling text takes a holistic approach as it distills the fundamentals that nursing students need to know to respond to today’s healthcare challenges competently, enthusiastically, and accountably. Reflecting today’s rapidly evolving healthcare delivery system, the Eighth Edition offers new content, new pedagogy, a revised art and photo program, and a wide range of online teaching and learning resources to save you time and help your students succeed. NCLEX-Style Review Questions for every chapter (over 900 in all) help students review important concepts and practice for the NCLEX. To further enhance your course, you may want to consider purchasing other products within the integrated suite of products designed specifically for the 8th Edition. Created with the students’ experience in mind, and coordinated to provide a cohesive learning experience, each product in the suite can be purchased separately or packaged with the main text. The suite includes: Study Guide, Skill Checklists, Taylor’s Clinical Nursing Skills, Taylor’s Handbook of Nursing Skills, Taylor’s Video Guide to Clinical Nursing Skills, PrepU, and, new to this edition, Lippincott CoursePoint, a digital curriculum solution for nursing education that integrates adaptive learning powered by PrepU with access to personalized, perfectly timed remediation built on trusted content. 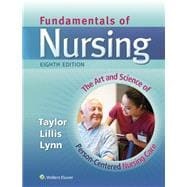 Fundamentals of Nursing: 5 out of 5 stars based on 1 user reviews.